When in 1949 in Holland the famous Zandvoort racing-track was constructed, all racing-enthusiast started looking for affordable racing-cars and some of them even started constructing their own cars. Some were made from scratch and some were constructed based on other older cars. Two excellent cars were constructed by racing-enthusiast and engineer Coos van der Tuyn, who had a garage in Rotterdam. He worked together with Mr. W. Adams to make both his racing-cars, based on the chassis and complete running gear of BMW 328’s. 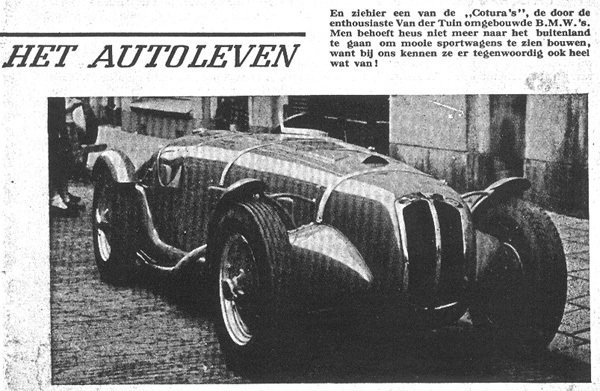 In the Dutch Car Magazine “Autosport” of May 1949 it was already mentioned that Van der Tuyn was constructing a BMW based racing-car. His first car was based on chassis #85019 and Coos van der Tuyn made the bodywork like the famous Frazer Nash Le Mans. The car was named COTURA which was an abbreviation of COos van der TUyn Racing Automobiles. His steel and partial aluminium bodied car was 100 kg lighter then a normal 328. This car #85019 also received a grill in the same style as the Frazer Nash. The second car which Van der Tuyn constructed had the typical BMW 328 grill. This made it very easy to identify this car on racing-pictures, and also of course the registration-plate PK-30-07 which the car received already in November 1953. Van der Tuyn practiced with the car on the Zandvoort circuit but the first races where driven by his friend W. Adams who was a more experienced racing-driver. On June 11, 1950 Van der Tuyn started his first race with the car in the National Sportscar Races. In the 2-litre class he immediately took the lead, ahead of the Ferrari of Mr. Roosdorp, but he already went of the track in the first lap. On the 20th. of September he returned to Zandvoort to break the 2 litre 1-hour record. But rain spoiled everything and he had to cancel his drive. But in the national press the excellent road-holding and very fast acceleration where noticed. Amongst his various race-participations in 1950 Coos van der Tuyn also started in the German Grand Prix at the Nurburgring circuit. He started in the Sportscar Class E for 1500cc up to 2000 cc and had racing-number 8. After the first 2 days of practice at the Nurburgring Van der Tuyn managed to have 7th. fastest time against better drivers and faster cars such as Ferrari and Veritas. The final result of the race is not known to us. In 1951 Coos Van der Tuyn allowed Hans Hugenholtz, racingdriver and designer of the Zandvoort racing-track, to drive the Cotura for a few laps at Zandvoort. He managed to do a lap of 2.08.7 which was an average of 117,28 Km/hour. For years this was Hugenholtz his personal record on his own circuit! In 1980 Hugenholtz was re-united with the car and he also mentioned that he remembered the Cotura to give you the feeling that the car could not get from the road in corners and the acceleration was incredible. 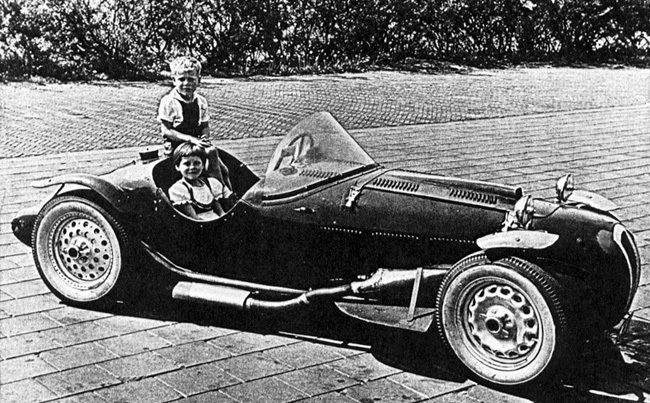 In 1952 this Cotura #85019 came into the hands of Dutch racing-driver Maasland and it was raced by himself and his daughter Joke Maasland. On the 27th. 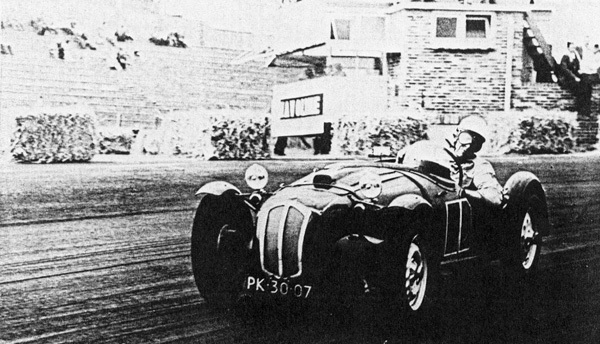 of July 1952 Maasland won the 2 litre class with his car. In 1953 the Cotura was purchased by Mr. Bos-Eyssen, a local cheese-merchant, with a love for car-racing. He had the Cotura #85019 registered for the road and the car received registration-number PK-30-07. 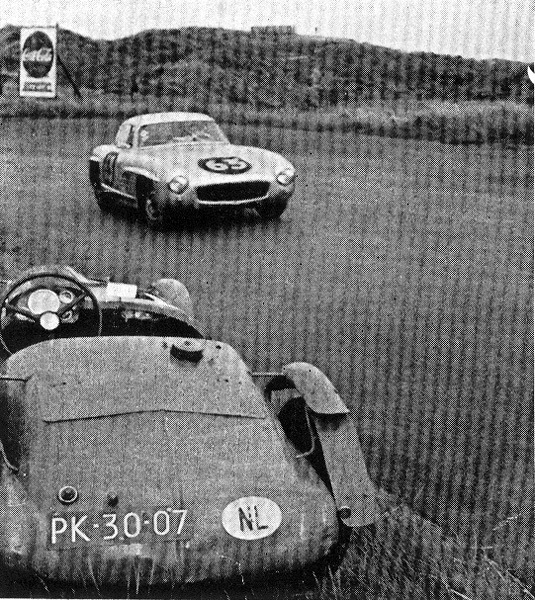 Amongst his various races with the car, Bos-Eyssen was in the National Sportscar Races on June 7, 1954 with the car with race-number 49 in the 1801-2000 cc class D.
In 1956 Mr. Paul Huis in ‘t Veld raced the Cotura at Zandvoort and the car was pictured at the side of the track, still with registration-number PK-30-07. Then the Cotura disappears for a few years and finally is discovered again in 1962. It was found in a garage in Bussum in Holland in completely neglected condition. Mr. H. de Groot, a retired technician, was the one who purchased the car as he loved the basic shape of the car and was inspired by the history of the car. He approaches Hans Hugenholtz for details and he does a lot of research. Then he finally decided to restore the car to its former glory. But it turned out that the engine of the car was beyond use and beyond restoration. For years water had been standing in the engine and therefore block and cylinder-head were destroyed. As it was in the 1960’s not easy to find a replacement 328 engine Mr. de Groot decided as alternative to use a 6-cylinder Mercedes 220 engine, complete with gearbox. He also decided to change the original Frazer-Nash style grill into the typical BMW 328 grill. In 1980 the car was ready and again Hans Hugenholtz was asked to test the car at Zandvoort and to write an article about the car and its history. And again Hans Hugenholtz states that the car is a great racing-car, even though it had a Mercedes engine and gearbox which weren’t perfect for the car. Then there turned out to be a German collector who had the other Cotura in his possession. This was the car with chassis-number 85119 which had the BMW 328 style grill. This German collector had his car ground-up restored and he used his car in various Mille Miglia’s. When he heard that the first Cotura 85019 was still in Holland he had to have that car also. After some negotiations he managed to buy the car and was the proud owner of both Cotura’s. But he of course did not like that car 85019 was restored with a Mercedes engine and gearbox and the wrong shaped grill. He decided to have the car ground-up restored again in 1992. But as he already had one Cotura with which he could drive rallies he thought it better to have car 85019 prepared for high-speed events and circuit racing. 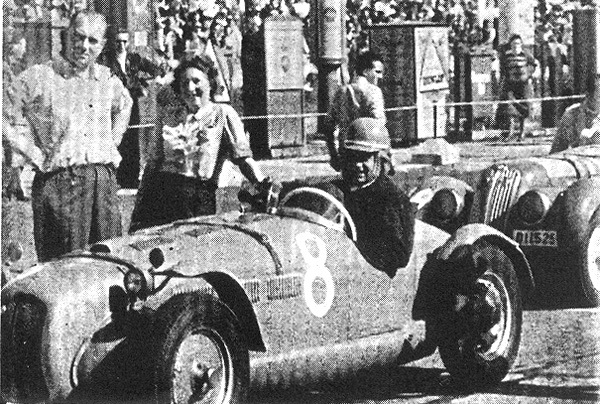 Therefore the replacement BMW 328 engine was given in the hands of the experienced German ex-BMW race-engineer George Thiele. He was ordered to tune the engine to maximum power that would last and not blow the engine. So the engine was equipped with a special balanced cranck, lightweight conrods, Mahle pistons, bigger valves and 3 Solex 32mm carburators. As the car did not have a gearbox yet it was decide not to use a BMW 3-speed gearbox but to make use of the stronger and better Volvo gearbox. This is a very common practice within BMW 328 users and racers as the Volvo gearboxes are stronger and more reliable. However, included with this car is an un-used correct ZF 4-speed gearbox which came from the old BMW stock. As the German owner did hardly use car 85019 after the restoration, because he kept using 85119, he decided to sell the car again. And surprisingly car 85019 was again sold to Holland in 1997. It came into the hands of a beginning collector who was fascinated by the Dutch history of the car. And even today the car still has the same Dutch registration-number which it had all its life: PK-30-07. Regretfully the present owner his time never allowed him to use the car neither. He had great plans to take the car to the Mille Miglia but until now he only took the car to a Concours at Paleis Het Loo in Holland. So after the restoration the car has hardly been used and is even today in an excellent condition. As the owner realises this is a competition-car which has to be used he has decided to sell the car again. This car comes from a private party and has Dutch registration documents. Also FIVA papers are with the car, in which the Volvo and the ZF-gearbox are both included. The car is priced at 200.000,-- EURO.